Exhibited at the Museum of Modern Art in New York. Foscarini Havana designed by Jozeph Forakis is a range of simple yet sophisticated lights. 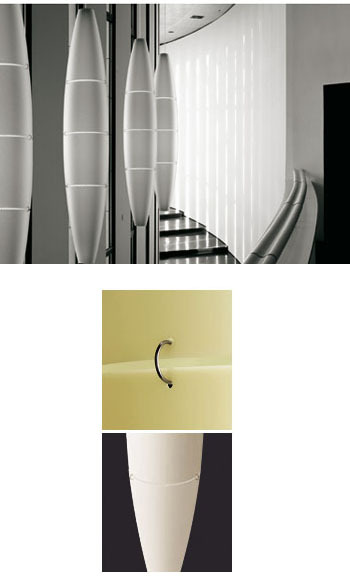 The shade is made from 4 linked elements in recyclable moulded polyethylene. Available in white or creamy yellow. The floor-standing version sits nicely in corners, as does the wall version which you hang from a hook mounted to the wall. The suspended ceiling version comes into its own in rooms with high ceilings, particularly flats/appartments with mezzanine floors or staircases. You can adapt the cable length of the drop to suit the application. And the "With Plug" ceiling version is just excellent for versatile applications - especially rented flats etc - when you don't want the expense of fitting lamps that you can't take with you!! Material: lacquered metal, diffuser comprising four satin-finish polyethylene elements. Bulb: 1 x 150W incandescent. Most lamps are in stock, usually ships in 6-8 business days or sooner.